Sepia tone action photograph of brown gelding, pacer Altemead George (far right) wearing head number six, Utton up. 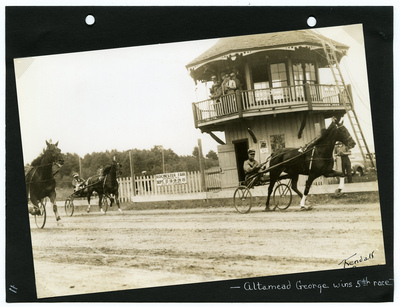 Altemead George handily claimed the first place finish in the second heat of the Classified Trot & Pace on July 3, 1940 at Narragansett Park on Gorham Fair Grounds, recording a time of 2.10 1/2. Isoloa's McElwyn (far left), Phalen up, finished second while Zipalong (center) wearing head number two, Safford up, showed in third.